Matsumoto Tooru no Kabushiki Hisshougaku (松本亨の株式必勝学, Matsumoto Tooru no Kabushiki Hisshougaku? lit. 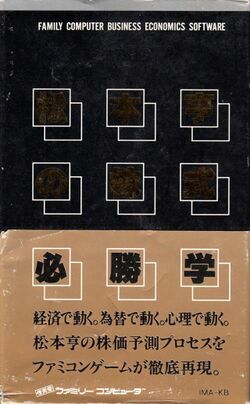 Tooru Matsumoto's Stock Success Knowledge) is a simulation game developed by Imagineer and published for the Famicom in Japan early on in 1988. The subject of this simulation is the buying, selling, and general trading of stocks on the Japanese stock market. Tooru Matsumoto is a known Japanese financial advisor who is considered very knowledgeable about the economics of bubbles in the market. The game contains a virtual stock trading mode where the player attempts to earn 100 million yen in the span of one year through stock market trades. In addition to this mode, the cartridge also contains programming that allows users to perform limited types of stock market within the medium-term government securities fund trades via the Famicom's phone modem peripheral. Though based on a considerably unusual subject for a home console, this game enjoyed considerable popularity for a brief period of time, and inspired a sequel, which was published the following year. This page was last edited on 27 March 2012, at 22:19.